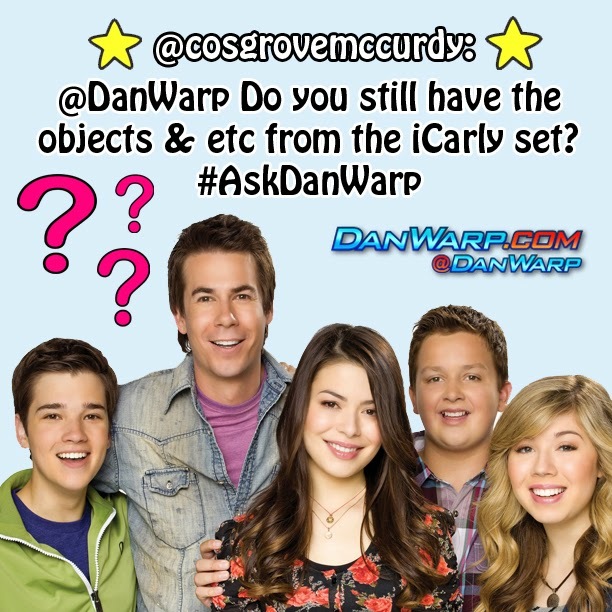 @CosgroveMcCurdy asks: Do you still have the objects, etc. from the iCarly set? Whenever one of my TV shows comes to an end, I walk around the sets with our production designers (the people who design and create our sets), and I tell them which things I want to keep from the show. After we film the final episode, all the things I want to keep are carefully packed into a truck. Some of the items are delivered to my house, but most are delivered to a special storage unit I have in Hollywood. I kept lots of stuff from iCarly. I have most of the living room furniture… and the front half of the Mustang car from the iCarly studio… and Freddie’s tech cart and video camera… Sam’s blue remote… some of Spencer's sculptures... and I even have the sparkly blue cowboy hat that Carly wore in the final party scene in the very first episode of iCarly – the same blue hat you see her toss up in the air during the open credits of every episode. I’ve always been a sentimental guy, so I really like to keep stuff from my past shows. For those of you who remember the first show I wrote and produced, I even have the original Big Ear of Corn!